Recently had the opportunity to outfit a family member's house with a new entertainment system. Had to nail down a beautiful and super easy-to-use solution for the holidays. Mission accomplished! Learned a few things along the way to share, should you choose to buy these exact 3 highly-rated items for yourself. Turn the TiVo on with your TiVo remote, with those Volume, Mute, and Input buttons working the correct devices flawelessly. Why this series of Samsung TVs? Well, mostly because of the reasonable 3 HDMI inputs, and the micro-dimming for excellent black levels, praised by many Amazon owner/reviewers. Efficient, thin, and fairly reasonably priced, with excellent picture quality, even in a room with huge lighting condition changes, thanks to the TV's 'Eco sensor' feature. 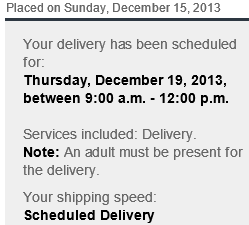 We ordered on Sunday, the TV arrived that Thursday, during the scheduled time window, as seen here. Full review here, with pretty stellar Amazon owner/reviewer comments. Price was $30 lower than Amazon at my local Sam's Club. Since we now pay sales tax either way here in Connecticut, it was less costly to buy local. You can turn a Plus into a Pro yourself with 10 minutes of basic screw-driver work, saving about $80. Read my article to learn how. And you might want to consider also getting the better, backlit, RF (no aiming required) TiVo Slide Pro Remote. Works great throughout your home, and the new remote finder button the Roamio itself will make locating that roaming Roamio remote much easier. Step 4) Hook it all up, make some basic tweaks, enjoy the show! There are some things to think about, like wiring it all up. Doesn't take much. Seriously, all you need is a 6' HDMI + Toslink Digital Audio Cable package from Amazon. Here's the beauty part, and the reason for so little wiring complexity, and such a simple setup. Just plug the HDMI cable in the TV's HDMI 1 port, and the other end into your TiVo Roamio. 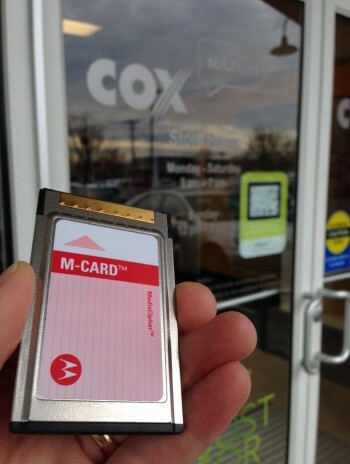 The TV's onscreen display actually automatically showed as "Cox", as in, Cox Cable TV service. Your Roamio's Dolby Digital 5.1 will just work? Why? Because you're also going to hook up that Toslink optical cable, from the TV's digital audio output, right over to the digital audio input on the speaker bar. What else? Well, power cables from the Samsung TV, the TiVo, and the Vizio speaker bar, and if you don't want to go with WiFi, then a network cable to your TiVo, and optionally, another to your TV. If you have other devices, you only need the one HDMI cable to each, such as the Apple TV we hooked up to HDMI2, and the Blu-ray player on HDMI3. Stick a Blu-ray disk in, the TV switches inputs automatically, and playback just begins. The way HDMI was supposed to work. Finishing touches? Plug in the power for the Vizio subwoofer behind your couch. It's already automatically bluetooth paired with the speaker bar, so no wires from the TV to the subwoofer, making things much easier. You will then wire those small left and right speakers to the back of the subwoofer, and you're done. Only a few more simple, effective tweaks to go, to get things working even more nicely. 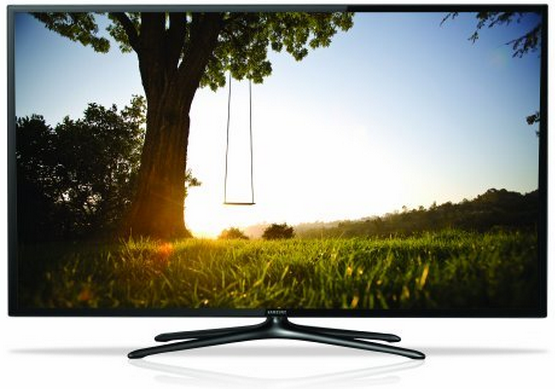 Follow along with the Samsung UF6400 Series TV Instruction Manual. Power up the TV, finish up those Samsung setup wizard questions, or just exit that wizard altogether, especially if you're not bothering with the Smart features. Turn off the Smart TV welcome screen (explained here), so you won't have to reach for the TV remote just to get out of that menu. That's right, stow it away, and just use the TiVo remote. Turn on the Eco Sensor for Screen brightness (page 24). This will allow the TV to perform automatic ambient light monitoring, changing the brightness of the TV based on the ambient room lighting conditions. Turn off the TV's internal speakers (page 88). The new TiVo Slide Pro Remote will work with your Roamio right out of the box, but you'll likely want to configure the remote to control your Samsung TV's power and input selection, and your Vizio's volume. Hint, treat it as a Vizio Amplifier, and the one remote code it offers you works. Works great actually, with volume changes with the TiVo remote showing as an increasing/decreasing row of indicator LEDs on the Vizio speaker bar, rather than a distracting volume display on the TV itself. We wound up not needing to tune anything with the Vizio remote (that has an LCD display), so we just stored it away with the TV remote, keeping just the TiVo remote handy. If you are upgrading from a TiVo 3 or earlier, you'll want to remember to stop by your local cable company store, to trade in those 2 single stream cable cards for a single multistream capable M-CARD. This avoids the delay and potential cost of a truck roll to your home. Pop the card in, call your cable carriers activations department, and just read them the numbers that automatically pop-up on your screen. If you didn't get the card on time, don't worry, the Roamio will let you view some of your basic cable line-up. If your previous DVR required one of these devices, usually free by request from your cable company, just move the USB cable over to either of the TiVo Roamio's USB ports on the back, and it should just work. At least for us it did. And you can keep your old TiVo plugged in to your home's network for a bit if you'd like, to transfer shows from the old to the new, explained by TiVo here. Let's end with a TiVo tip. Did you know that you can use the Netflix app on your iOS device, and tap the little icon to display it on your TiVo Roamio instead? Yep, that easy, it automatically begins playback on your TiVo. Cool, no? It's called the DIAL standard, which stands for Discover and Launch. And don't forget to load the TiVo app on your iPad/iPhone, for streaming to your mobile device, as I explained here. This will work even when away from home, when using WiFi, but soon, even on cellular connections. It seems that the Vizio Soundbar automatically sets the volume to zero if it receives no sound input for 4 hours. So you may want to turn off the Eco function of the Vizio using the remote, to avoid having to turn the volume up from zero whenever you turn the TV on after it's been off for a while, just to avoid the hassle factor (at the expense of some watt burn). If you're having issues with setting up multiple TiVo Slide Pro remotes, try unplugging the TiVo, then plug it back in. Worked for me, as I was then able to very easily add remote #3 and #4 to this same TiVo Roamio. Nice! More about the learning functions (only works on the TV Power, Mute, Input, Volume Up, and Volume Down buttons) at support.tivo.com. Certainly wouldn't be a bad idea to pick up a UPS to protect your new stuff, and nice to be able to easily determine how few watts your new entertainment center uses. 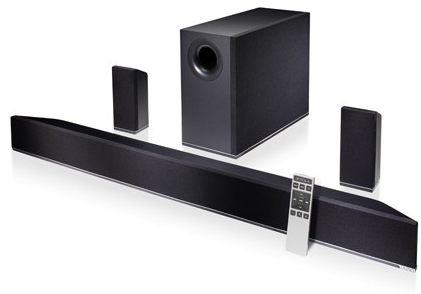 The gear above, including the soundbar (but not the subwoofer) uses about 130 watts, total, with the volume up loud. Oh yeah, that was using a Blu-ray player, and some other small adapters (like the SDV device), so the TV, soundbar, and TiVo alone are probably closer to 100 watts total. I now have a very brief video of this configuration at a family member's home, showing the TiVo Slide Pro remote in use, operating the Vizio soundbar, while keeping an eye on actual watt draw using the handy UPS battery. Extended family still happy with this trio of purchases. Related Google+ post here. See also instruction manual, and woot discussion about the sound bar, with a lot of great info and links.